OH HAI! Taking a break from CastleVille- I mean, I've been really busy lately... with the uh, house... and stuff. No seriously, we have some big posts in the works, but Francis was my photographer with his fancy paparazzi camera and we have a lot to sort. 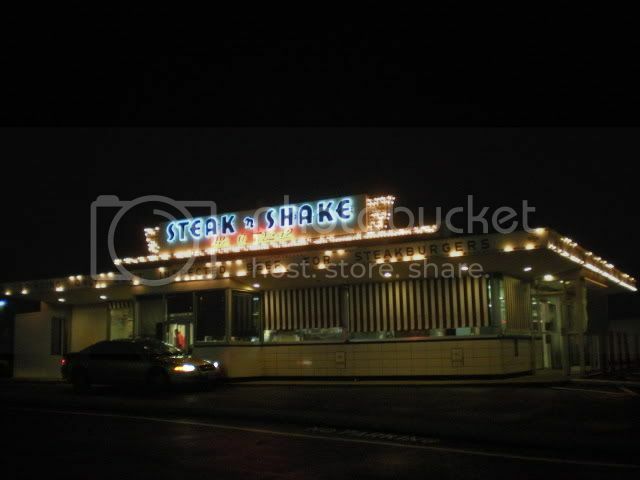 Today I'd like to point out the Lemay Ferry Steak N Shake. 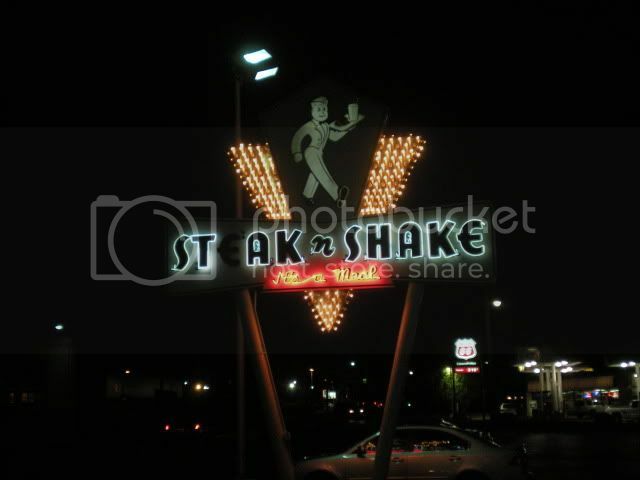 Yes, Steak N Shake is a big chain restaurant in the midwest, but it started as a diner in Normal, IL (about 170 miles north of St Louis) in the 1930s. Remember that old slogan "In Sight, It Must Be Right?" That's from when Gus Belt, the founder, used to grind up the steakburger meat in full view of the diner. Franceth Manor is the farthest south I've ever lived in the St Louis area, and it took us some time to get used to driving to south county instead of wasting time snaking through city streets to get to Home Depot or Target. On one of those forays, I learned that our street eventually turns into Lemay Ferry, and this old Steak N Shake was a complete surprise to me. Apparently it has been there since the 1950s. In trying to figure out how that Steak N Shake managed to survive, I discovered this fantastic website, Antique Warehouse's Inside St Louis. This is a series of essays and reviews of local St Louis landmark restaurants, written by Ron "Johnny Rabbitt" Elz and illustrated by Marilynne Bradley. Really neat stuff. I hope you'll check it out!